Want to learn how to grow vegetables? Vegetable Growing Basics is for beginning gardeners or anyone needing a refresher class. 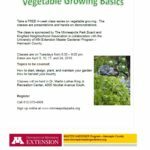 Sign-up for the free class offered by the University of Minnesota Master Gardener Program, held at MLK Park, beginning April 3rd. Classes are on Tuesdays from 6:30-8:00pm. This is a four-week program (4/3, 4/10, 4/17, and 4/24, 2018) that covers how to start, design, plant, and maintain your garden. Classes are free and open to adults 18 and older, but interested teens are welcome to attend with a parent. The class is hands-on, and meets outdoors at the raised garden beds at the northwest corner of MLK Park, 40th and Nicollet. To register for the class, go to: https://apm.activecommunities.com/minneapolisparks/Activity_Search/vegetable-growing-basics/76501 or, phone MLK park at 612-370-4908. You are registering for Vegetable Growing Basics. You will need to give your name, address, phone number, and email address, if you have one. Please call 612.370.4908, or visit www.minneapolisparks.org to sign up!